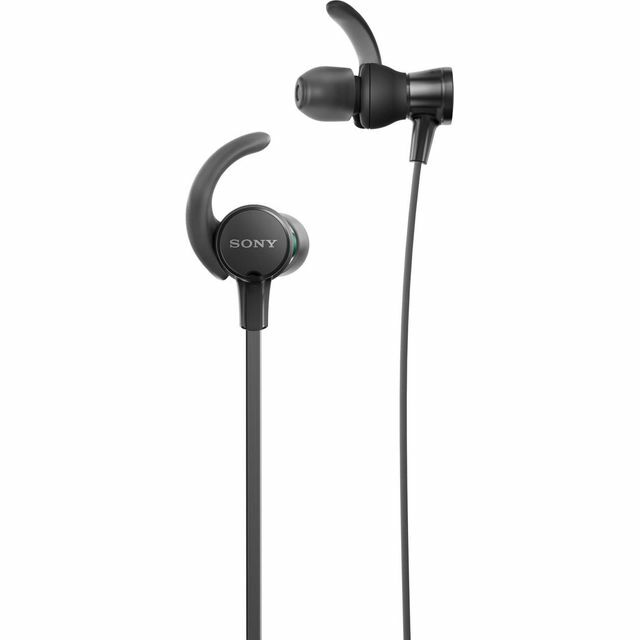 Listen to your ultimate workout playlist on these black in-ear headphones from Sony. They connect via a standard 3.5mm headphone port, so they will easily plug into your phone or tablet. They’ve been specially designed for active use with a support that comfortably fits around your ear, so they won’t fall out halfway round your run. The earbuds are removable, so you can keep them fresh too. And, there are integrated play, pause and call handling controls built into the wire, so even if your friends drop you a call mid-workout you can still pick up. These headphones fit discreetly in your ears and are ideal for listening on-the-go. They use specially designed soft buds which sit inside your ears and because they’re really small, they’re perfect for putting in your pocket until you need them. Designed specifically for listening to music wherever you are, they’re easy to carry and ideal for everything from the daily commute to an intensive gym workout. These headphones use a classic wired connection with a 3.5mm jack to plug into your phone or tablet. With this connection information can flow superfast, producing a better audio quality, making your favourite tracks sound flawless. Compared to wireless headphones, these will be more useful in areas of high interference, such as hospitals or offices, as other signals won’t disrupt the connection. Also, wired headphones don’t require batteries, so they’ll never run out of charge. When you’re training hard, you need headphones that can keep up with an active lifestyle. Created specifically for people playing sport, the special design of the headphones fit snuggly in the ear so they never fall out – whether you’re running, lifting or rowing. They’re also incredibly durable, so however demanding your workout routine gets, your motivational tracks will keep booming.